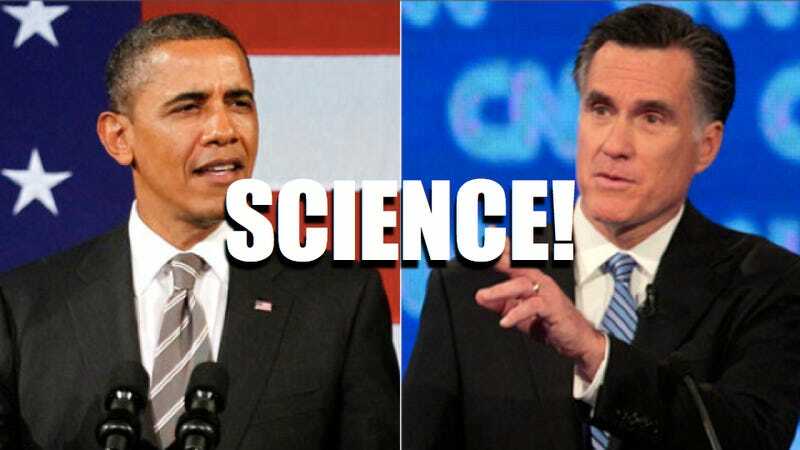 Romney and Obama have agreed to answer questions on science and science policy, but it's a bittersweet victory. A few weeks ago we told you about ScienceDebate, an independent citizens' initiative devoted to having Obama and Romney face off over fourteen questions about science in a publicly televised debate. Now, ScienceDebate.org reports both presidential candidates will address the questions (which you can read after the jump) by August 31st — but their responses will be delivered in writing. In many ways this is great news, but America needs to demand more of its candidates. The initiative — which is backed by organizations including AAAS, The National Academies and Scientific American, to name a few — tried to have Obama and McCain debate over a similar list of science questions back in 2008, but the two replied in a written fashion then, as well. The fact that Obama and Romney have agreed to address these questions (and it really is a fantastic list — we've included it again, below) at all is significant, but it is vital that we continue to push for the candidates to address these issues in a public forum that allows for discussion, direct debate and followup questions. When we brought ScienceDebate's list of questions to your attention last month, many of you commented that any politician worth his or her salt would be able to skirt around these prompts with relative ease. That may be true, but it's a hell of of a lot more difficult for politicians to pull this off in a debate format, where each participant is forced to confront and contend with an opponent's positions in real-time. America, and the rest of the world, 100% needs and deserves that kind of discourse. Read more about the initiative, and sign a petition calling for the candidates' participation in a debate devoted to science and scientific policy, over at ScienceDebate 2012. 1. Innovation and the Economy. Science and technology have been responsible for over half of the growth of the U.S. economy since WWII, when the federal government first prioritized peacetime science mobilization. But several recent reports question America's continued leadership in these vital areas. What policies will best ensure that America remains a world leader in innovation? 2. Climate Change. The Earth's climate is changing and there is concern about the potentially adverse effects of these changes on life on the planet. What is your position on cap-and-trade, carbon taxes, and other policies proposed to address global climate change-and what steps can we take to improve our ability to tackle challenges like climate change that cross national boundaries? 3. Research and the Future. Federally funded research has helped to produce America's major postwar economies and to ensure our national security, but today the UK, Singapore, China, and Korea are making competitive investments in research. Given that the next Congress will face spending constraints, what priority would you give to investment in research in your upcoming budgets? 5. Education. Increasingly, the global economy is driven by science, technology, engineering and math, but a recent comparison of 15-year-olds in 65 countries found that average science scores among U.S. students ranked 23rd, while average U.S. math scores ranked 31st. In your view, why have American students fallen behind over the last three decades, and what role should the federal government play to better prepare students of all ages for the science and technology-driven global economy? 6. Energy. Many policymakers and scientists say energy security and sustainability are major problems facing the United States this century. What policies would you support to meet the demand for energy while ensuring an economically and environmentally sustainable future? 7. Food. Thanks to science and technology, the United States has the world's most productive and diverse agricultural sector, yet many Americans are increasingly concerned about the health and safety of our food. The use of hormones, antibiotics and pesticides, as well as animal diseases and even terrorism pose risks. What steps would you take to ensure the health, safety and productivity of America's food supply? 8. Fresh Water. Less than one percent of the world's water is liquid fresh water, and scientific studies suggest that a majority of U.S. and global fresh water is now at risk because of increasing consumption, evaporation and pollution. What steps, if any, should the federal government take to secure clean, abundant fresh water for all Americans? 9. The Internet. The Internet plays a central role in both our economy and our society. What role, if any, should the federal government play in managing the Internet to ensure its robust social, scientific, and economic role? 10. Ocean Health. Scientists estimate that 75 percent of the world's fisheries are in serious decline, habitats like coral reefs are threatened, and large areas of ocean and coastlines are polluted. What role should the federal government play domestically and through foreign policy to protect the environmental health and economic vitality of the oceans? 11. Science in Public Policy. We live in an era when science and technology affect every aspect of life and society, and so must be included in well-informed public policy decisions. How will you ensure that policy and regulatory decisions are fully informed by the best available scientific and technical information, and that the public is able to evaluate the basis of these policy decisions? 12. Space. The United States is currently in a major discussion over our national goals in space. What should America's space exploration and utilization goals be in the 21st century and what steps should the government take to help achieve them? 13. Critical Natural Resources. Supply shortages of natural resources affect economic growth, quality of life, and national security; for example China currently produces 97% of rare earth elements needed for advanced electronics. What steps should the federal government take to ensure the quality and availability of critical natural resources? 14. Vaccination and public health. Vaccination campaigns against preventable diseases such as measles, polio and whooping cough depend on widespread participation to be effective, but in some communities vaccination rates have fallen off sharply. What actions would you support to enforce vaccinations in the interest of public health, and in what circumstances should exemptions be allowed?